Bought some of these as it is the back of my hands and fingers I have trouble with. Fused connector from the battery simple to fit and pops out front edge of the seat. Ran the leads inside an old soft shell jacket I wear as a layer when it is colder. No separate controller, each glove has a push button on the back to turn on/off to one of three heat settings. Don’t notice the leads, gloves are comfy and warm as they are (3 season weight /thickness). Once the turned on they give a good consistent heat across the back of the hands and down each finger. They were just what I needed for a 2 hour round trip on Monday night. Dual carriageway and 4degrees. Kept hands comfortable on the middle setting. Plus 1 for heated gloves! I went cordless though- Bering. Good enough for 2-3 hrs on a full charge. 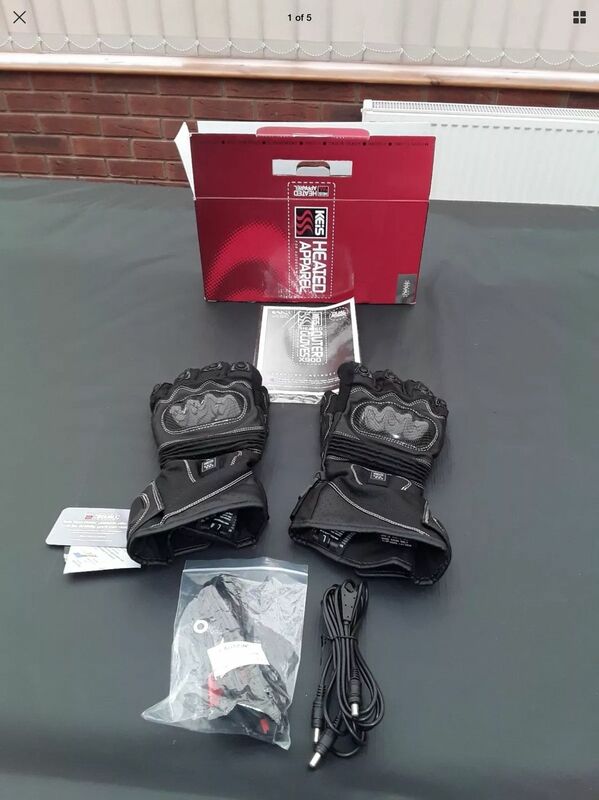 I’ve bought the RST heated gloves that run off lithium batteries, brilliant! I wish I’d invested in a pair years ago. I’d thought about going the battery route. Those RST one’s have the battery in the cuff? Wasn’t sure whether that bit of weight on the wrist would be a distraction/hinderance. The Keis ones can be fed from a separate Li battery. I’ve actually just got a Keis heated waistcoat as well and the gloves can be daisy chained off it. Again has the option of sticking an Li battery in a pouch. I tried the waist coat and gloves combo today. I was disappointed it was 7 degrees! With both on the middle setting and with no usual extra layers on it was perfect. I’ve got used to plugging in and switching on now after only a few uses. I ‘needed’ new winter gloves and a new inner layer so going heated was only an extra on top. I’d thought about going the battery route. Those RST one’s have the battery in the cuff? You really don’t notice the batteries, they are completely unobtrusive.